Complicating such stereotypical representations of the Indigene in early Canadian settler children’s literature are the poems, short stories and autobiographical sketches of Tekahionwake (E. Pauline Johnson). Born on the Six Nations Reserve near present-day Brantford in Ontario, Tekahionwake was of mixed Haudenosaunee and European descent. 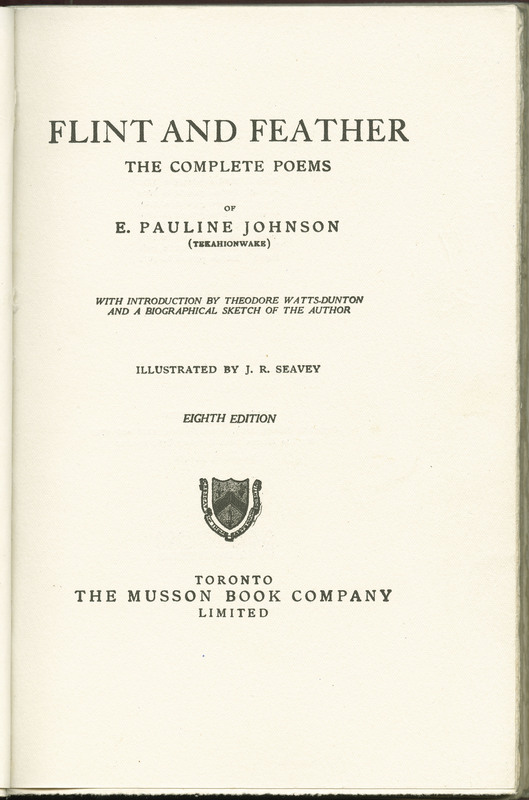 Known primarily for her poetry collection Flint and Feather (1912), Tekahionwake also published short stories in juvenile periodicals including The Boys’ World; some of the pieces, such as “A Red Girl’s Reasoning,” in the posthumously-published The Moccasin Maker (1913),are remarkable for depicting the perspective of a young Indigenous woman and her complicated relationship to identity. 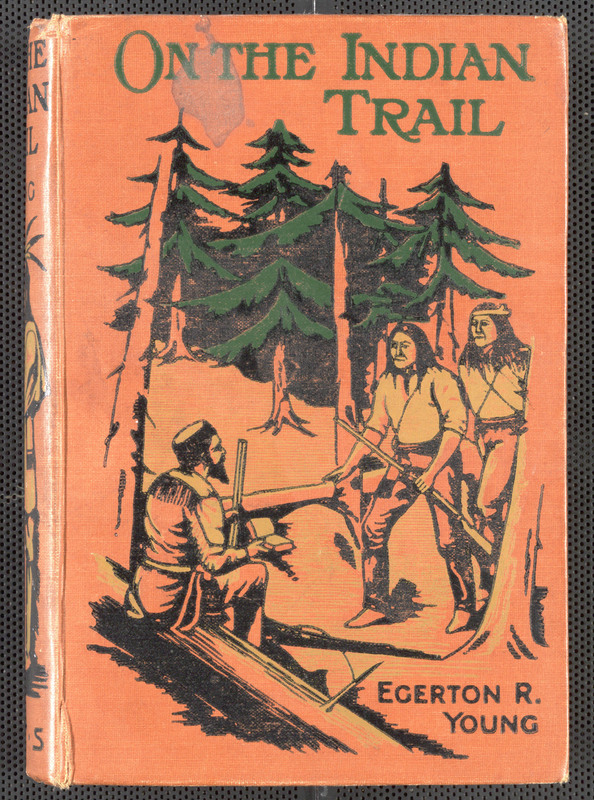 Later examples in the collection demonstrate the continuing fascination held by white settler colonial authors for appropriating the traditional stories of Canada’s First Nations and publishing books for children with subjects relating to Indigeneity. 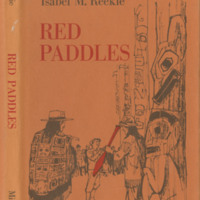 Titles such as Isabel M. Reekie’s Red Paddles (1968), Tales the Totem Tell by Hugh Weatherby (1944), Clara Lois Tyner’s Totem, Tipi and Tumpline (1955)and Tales of Nanabozho by Dorothy M. Reid(1963)are among those published in the later nineteenth-century by white retellers, particularly during the heightened nationalism surrounding Canada’s Centennial year in 1967. 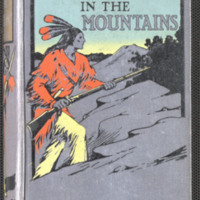 However well-researched some of these books may have been, it is evident that they sought to entertain and instruct settler child readers with Romanticized versions of traditional Indigenous stories, that their illustrations often trivialize the Indigenous figures in the stories, marking their complicated relationship to the process of indigenization identified by Terry Goldie, and the history of cultural appropriation by white settler Canadian authors. Like CLC 498, The Adventures of Two, these two copies of Egerton Ryerson Young’s On the Indian Trail are good late examples of a Victorian publishers’ binding. Egerton Ryerson Young, named for the famous Methodist preacher and Chief Superintendent of Education Egerton Ryerson, was born in Crosby Township and raised in Bond Head just north of Toronto. After abandoning a career as a teacher, Young took to preaching as a Methodist itinerant. The bulk of his time was spent as a missionary working among indigenous peoples in western Canada. 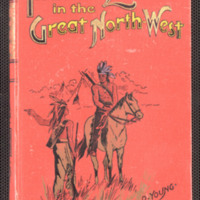 While travelling the lecture circuit in North America in the following years, Young drew on his experiences as a missionary to write more than a dozen popular books including On the Indian Trail. Interestingly, these books were published not by Young’s own denominational publisher the Methodist Book and Publishing House in Toronto, but rather by the much larger Religious Tract Society (RTS) in London. On the Indian Trail first appeared in 1895 under the Society’s imprint. It was a popular title. The RTS printed it again two years later as did Fleming H. Revell and Company in New York. Additional RTS printings quickly followed in 1898, 1899, and 1900. 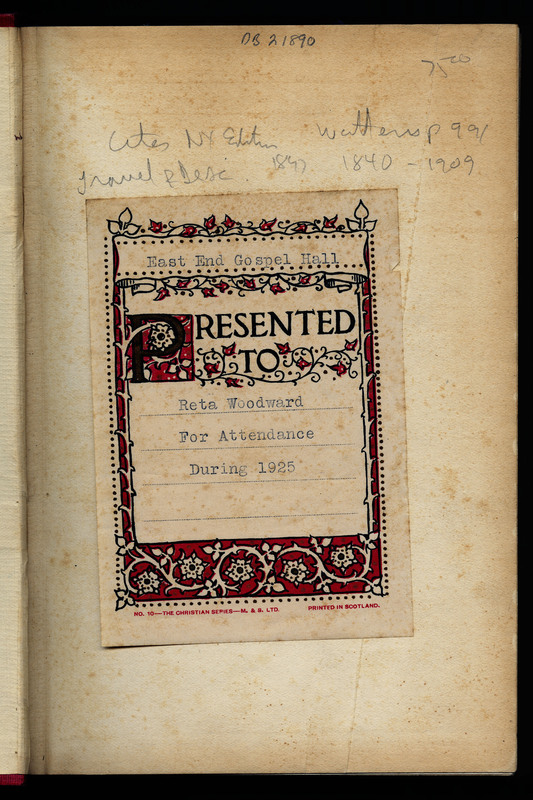 One of the two copies here, probably printed by the RTS in 1922, is noteworthy for the reward plate pasted to its front flyleaf. The plate indicates that the East End Gospel Hall in Toronto presented On the Indian Trail to Reta Woodard as an attendance reward in 1925. Making rewards of books of this kind to those who attended Sunday schools was a common practice throughout much of twentieth century, though it is interesting that this particular book, which Young seems to have written primarily with young boys in mind, was here presented to a girl. The East End Gospel Hall continues to function today under the name Broadview Gospel Hall in Toronto. Emily Pauline Johnson, also known as Tekahionwake, was born in Brantford, Ontario in 1861 and died in Vancouver, British Columbia in 1913. In between she became famous across Canada for the poetry she wrote celebrating her indigenous background. Raised by a mother who was an English immigrant and a father who was a Mohawk chief, Tekahionwake published her poetry in a wide variety of Canadian periodicals including the Globe and Mail, Goldwin Smith’s The Week, and Saturday Night. It is thus appropriate that Tekahionwake also chose to have her complete poems published in book form in Canada. Although The Musson Book Company operated most often as an importer and distributor of books, in this instance Musson took on the role of publisher for Flint and Feather in 1912 after contracting with Toronto printers and bookbinders Warwick Brothers & Rutter to finish the job. For a book written by a Canadian and published by a Canadian firm it proved to be enormously popular. Musson’s initial 1912 edition comprised 2,000 copies that were quickly sold out. 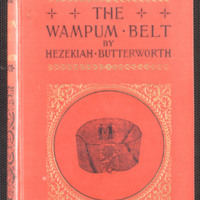 Between its first appearance in 1912 and the middle decades of the 1960s, the book, which was revised and enlarged along the way and was occasionally offered in a deluxe velvet calf binding as well as in cloth, continued to sell at the rate of about 1,500 copies per year for a total of almost 80,000 copies throughout its first five decades (W A Deacon, “The Fly Leaf: A New Way to Sell Books” The Globe and Mail 3 February 1962, p. 14). It remains in print today. This particular copy belongs to Musson’s eighth printing in 1922. 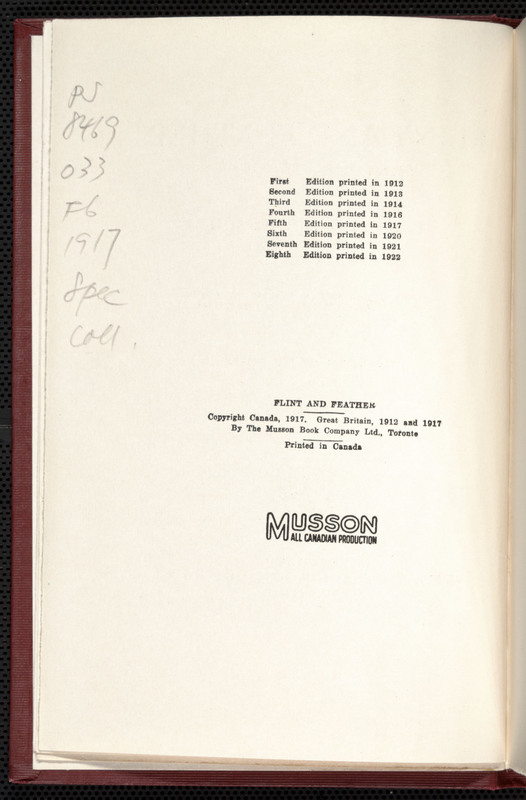 It is interesting to note that Musson first registered the book’s copyright in Great Britain at a time when Canadians continued to be governed by Britain’s imperial copyright law. Although Canada did not pass its own distinct copyright law until 1921, Musson was prompted to register the book’s copyright in Canada as well when a pirated edition published by Hodder and Stoughton appeared in Toronto in 1917.